Description: Setting behind a fence in Great Bend Kansas is this Pacific. Description: Santa Fe 3400-class heavy Pacific displayed in the park at Great Bend, KS. Looks like she could use a coat of paint. Description: This Santa Fe pacific was in a park in Great Bend Kan. Looks good for being off the road 60 years. Description: History of Locomotive 3416 Purchased in 1919 from Baldwin Locomotive works at Eddystone Penn. 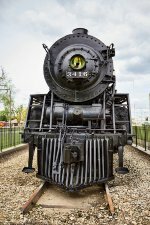 at a cost of $69,800.00.Used in passenger service on Illinois and Missouri divisions of the Western Lines,and Northern Division of the Gulf lines.Converted from coal to oil in fueling in 1939.Retired from service in November 1953. Specifications Total mileage of operation - 2,262,673 Weight, engine and tender - 419,003 pounds Length,coupler to coupler - 95ft. 8in. Capacity of tender - 7,000 gals. of oil - 20,000 gals. of water Wheel diameter - 79in. Cylinder diameter - 25in. 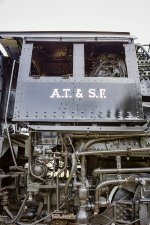 Piston stroke - 28in Tractive force - 41,400 pounds Boiler diameter - 78" Firebox - 114 in. x 84 1/4 in. Boiler pressure - 220 per sq in.